1. Toss the beef cubes with 1 tablespoon of vegetable oil. In a separate bowl, stir together the flour, salt, pepper, and cayenne pepper. Dredge the beef in this to coat. 2. Heat the remaining oil in a deep skillet or Dutch oven over medium-high heat. Add the beef, and brown on all sides. Add the onions, and garlic. Stir the tomato paste with the water to dilute; pour into the pan and stir to blend. Reduce the heat to medium, cover, and cook for 5 minutes. 3. 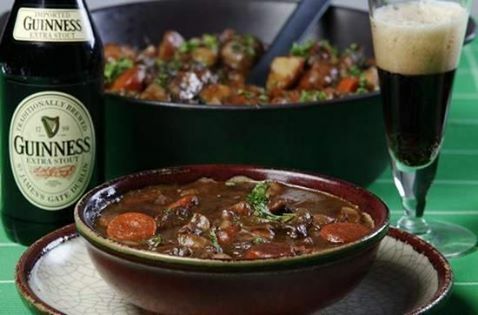 Pour 1/2 cup of the beer into the pan with the stock, and as it begins to boil, scrape any bits of food from the bottom of the pan with a wooden spoon. This adds a lot of flavor to the broth. Pour in the rest of the beer, and add the carrots, celery, brown sugar, bay leaves and thyme . Cover, reduce heat to low, and simmer for 2 to 3 hours or transfer to heated crock pot, stirring occasionally. Taste and adjust seasoning before serving. Garnish with chopped parsley. serve with mashed potatoes! F.Y.I if you want to add potatoes to the stew, add more salt and pepper!